The Finder’s Cover Flow view is an amalgam of the List view and Apple’s Quick View technology, which lets you see the actual content of a Finder item within its icon. 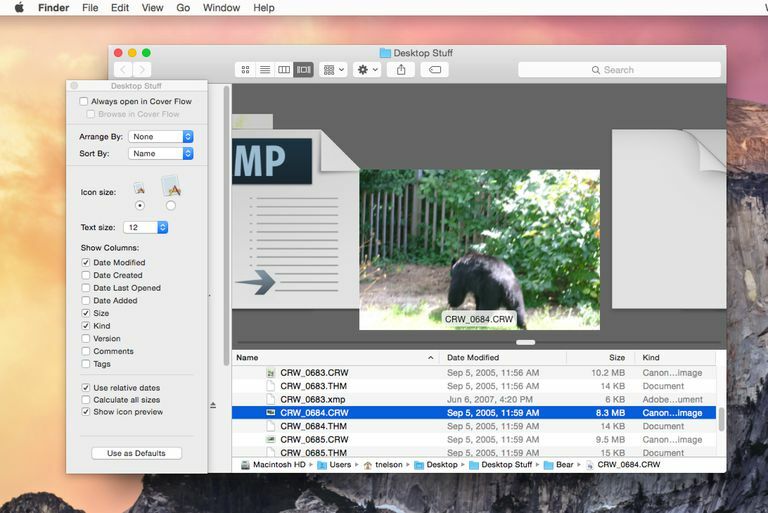 Cover Flow breaks the Finder window into two distinct panes, with the standard List view at the bottom and Cover Flow view at the top. If you select an item in one pane, it will be highlighted in both panes. The advantages of Cover Flow view are how quickly you can scan through all the items in a folder, using the Cover Flow slider, and the ability to see an item’s content in Icon view as you scan through the items. Cover Flow view options are predominantly the same as List view options, which makes sense because List view is one of the panes shown in Cover Flow view. If you’re viewing a folder in the Finder in Cover Flow view, here are some additional options that will help you control how it looks and behaves. Open a folder in a Finder window. Make sure you're in the Cover Flow mode by selecting "as Cover Flow" from the Finder's View menu. Always open in Cover Flow: Placing a check mark next to this option will cause this folder to always use Cover Flow view when you first open the folder. You can, of course, use the Finder view buttons to change the view type after you open the folder in the Finder. Arrange by and Sort options are presented as dropdown menus. To understand how the Arrange and Sort options interact, take a look at Understanding the New 'Arrange By' Option. Icon size: Cover Flow view offers two icon sizes: small and large. The icon size option does not affect the size of the Cover Flow pane or the icons located there. Instead, it refers to the icons used in the List pane. Selecting the small icon size will allow you to see more information in a Finder window while choosing the large icon size will allow the icon to display more detail. Date Last Opened: Lists the date of the last time the items was opened by any user or app. Date Added: Adds a column showing when the item was added. Version: Displays the version attribute, if set. Applications are the only type of item that will usually have a version attribute. Tags: This column will display the color of a tag assigned to the item if any, Tags replaced Labels used in previous versions of OS X. Use relative dates: You can display dates by their actual calendar date or as a relative date from today. For instance, relative dates might display as ‘Yesterday, 5:13 PM’ or ‘Today, 4:00 AM.’ Dates older than yesterday are shown as calendar dates. Calculate all sizes: This option is only active if you have chosen ‘Size’ as one of the columns to display. When this option is checked, all items, including folders, will display their size. Calculating the size of a folder can take a long time, especially if it contains a large number of subfolders. If you don’t need to know a folder’s size, uncheck this option. The last option in the Cover Flow view window is a ‘Use as Defaults’ button. Clicking this button will cause the current folder’s view options to be used as the default for all Finder windows. If you click this button by accident, you may not be pleased to discover that every Finder window now displays its contents with Cover Flow. To find out more about setting the Finder's default view, see Setting Finder Views for Folders and Sub-Folders.